Disclosure: I received sample products for review. No other compensation was received and all views expressed are my own. Our collection of toy vehicles is vast. And when I say vast...I mean kind of overwhelming. Lincoln doesn't play with cars quite as much as he used to, but there are still little cars everywhere in my house a good portion of the time. I've always wanted to have a nice road map that Lincoln could use to drive his cars on, but every time I've come across one, they have been pretty small. When you have 200+ cars....you need some space to drive! So, you can imagine my delight when I was given the chance to review the Happyville Smart Mat from PlaSmart. 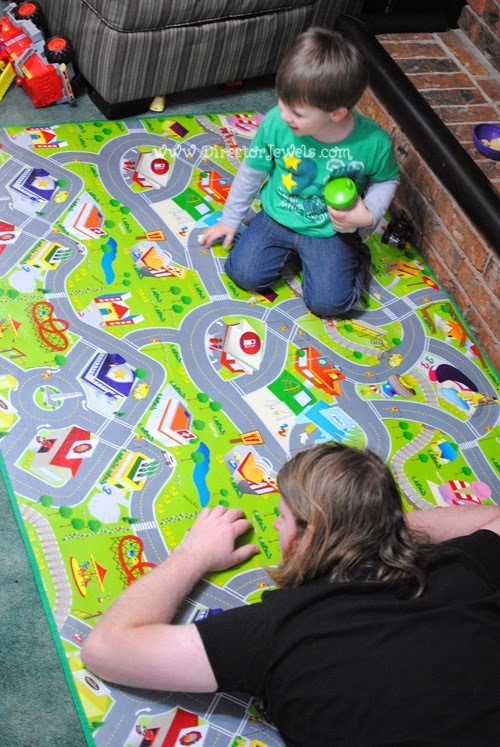 Measuring in at 78"x46", this floor mat is perfect for our huge collection of little vehicles to call home. 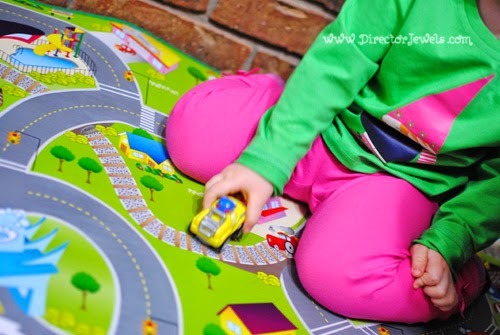 Made to last through many a toddler driving toys and crawling rambunctiously across it, the Happyville Smart Mat features quality, coated EVA foam that is immensely brighter than any other "road rugs" I have seen on the market. The colors are vibrant and inviting, and both of my kids had eyes as wide as saucers the first time I pulled out this mat for them to play. 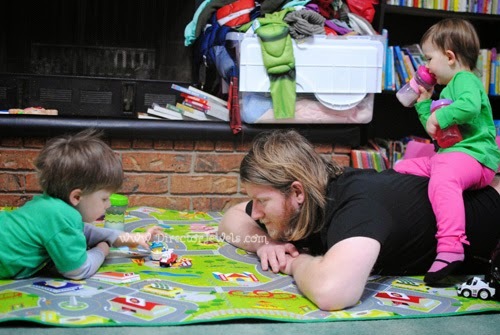 Driving cars along the windy roads of the play mat has quickly become a favorite pastime for Lincoln and Addie - and even Daddy gets in on the action sometimes! The mat takes up a fairly large space in our living room, but it rolls up for storage so easily that it has never been even a minor issue. My only concern is that my kids may use the cars to poke holes through the foam - we have a couple of spots on our mat where it is obvious someone felt the need to have an attack car strike. In spite of my destructive little ones, however, the mat has held up extremely well. Kids (and grown ups) of all ages can enjoy this mat, and with a $29.99 price tag, it's not a steep investment! There is also a Castletown Smart Mat available. Either mat would make an excellent playroom addition, or fit nicely into a classroom play corner! 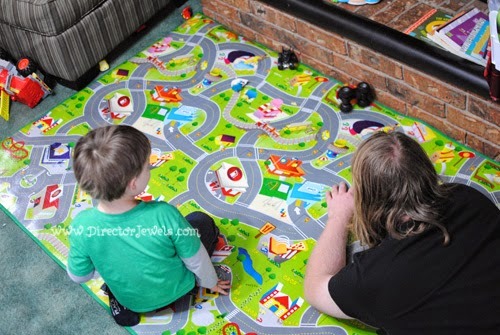 We think it's great fun to drive cars around our Smart Mat all day...wouldn't you? PlaSmart was also kind enough to send along a Wonky Wheels Finger Car for Lincoln. They must have read his mind - when he saw it, he said "it's blue because my favorite color is blue!" and proceeded to examine every inch of it. 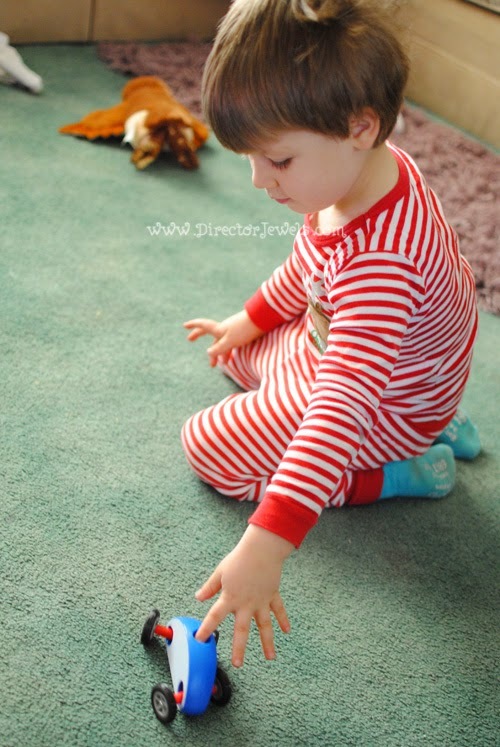 He automatically knew that the indentation on top was meant for his finger, and he has spent hours since that day driving this car around - on not only the Smart Mat, but every surface of our house! Wonky Wheels (which he calls his "wonky car") has become one of his favorite toys and he brings it along with us on adventures outside the house all the time - it was even the sole toy he picked to bring on vacation this December! If that's not love, I don't know what is. I love that the car seems to move in a new way each time you play with it, and it helps develop motor skills. Toys that help kids learn without realizing they're learning are the best...don't you think? Wonky Wheels would make a great, unique stocking stuffer! 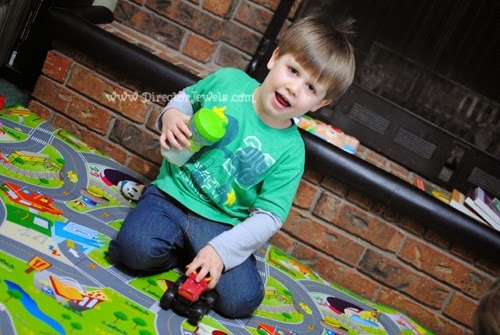 We love our Happyville Smart Mat and the Wonky Wheels car! Visit PlaSmart to find out more about these and other great titles. You can also follow along on Facebook, Twitter, Pinterest, YouTube, G+, and LinkedIn for all the latest updates. 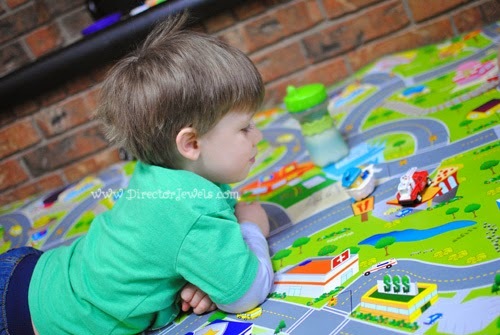 One Director Jewels reader will win a Happyville Smart Mat and a Wonky Wheels Car! This giveaway will end on December 31 at 11:59pm CST. This giveaway is open to US readers only. Winner will be emailed and will have 48 hours to respond or prize will be forfeited. Disclosure: Thank you to PlaSmart for providing my review sample and the giveaway prize! I received no other compensation and all views expressed are my own. For more information, you can read my Giveaway Policy and my Disclosure Policy. I also like their Plasma Bikes. Their plasma car looks so much fun! I think it would be a hit at Christmas time or a birthday gift. I think the Squashed game looks pretty cool. I can just see my toddler getting into a game like that when he's a little older! Fun Slides Carpet skates would be so much fun. I like the plasma car. I would like the Original Plasma Car in green for my grandson. I know he would love it. I like the Morphology game. I think the Hiccups hand held game looks fun for all ages. 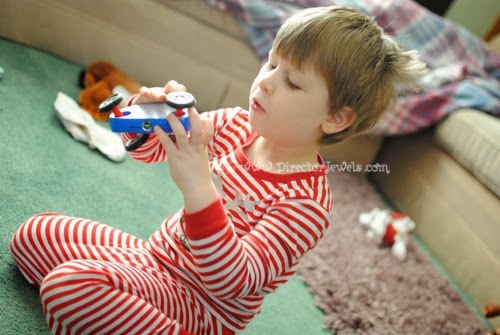 My son would love their Fun Slides Carpet Skates, he often pretends to ice skate in the house!